The IPR2 3000 boasts 1,490 watts per channel at 2 ohms and is under 7lbs. Featuring 2 channel independent fourth order Linkwitz-Riley crossovers, a variable-speed fan housed in a lightweight aluminum chassis, DDT speaker protection, and the revolutionary new IPR class D topology. 5" x 35.75" x 4"
3000 Watt Lightweight Power Amplifier. 1640W RMS x 1 at 2 ohms. 930W RMS x 1 at 4 ohms. 470W RMS x 1 at 8ohms. 1490W RMS x 2 at 2 ohms. 840W RMS x 2 at 4 ohms. 440W RMS x 2 at 8 ohms. 2 channel independent, fourth-order Linkwitz-Riley crossovers. Complete microphone/microphone stand package. Includes PV®i100 dynamic cardioid microphone. Designed for stand-mount application. Black powder-coat finish tripod microphone stand with boom arm. 6 meter microphone cable. Mic clip. Convenient nylon carry bag. Also available with 1/4" cable. 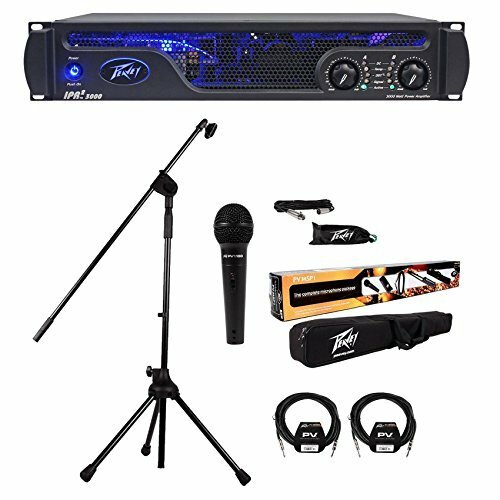 The PVTM MSP1 features Peavey's performance-ready PV®i 100 dynamic cardioid microphone, which can be switched off when not in use, as well as a fully adjustable, tripod-style boom stand that works equally well with vocals, acoustic guitars, amplifiers, drums or any other instruments. The package also includes an XLR-to-XLR or XLR-to-1/4" cable; a mic stand clip; and a protective nylon mic bag.